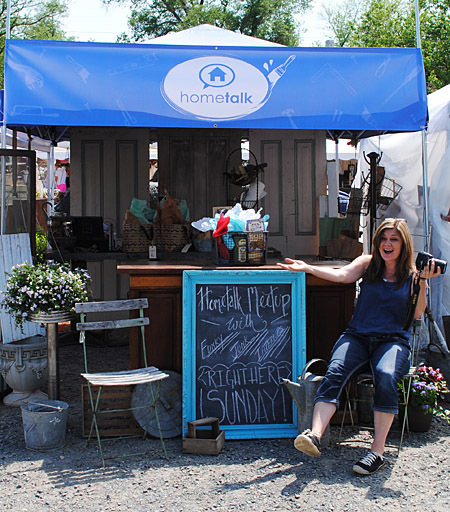 Last week Donna, from Funky Junk Interiors, flew in all the way from Canada to participate in the Hometalk Tent at The Lucketts Spring Market! She stayed at my house for a couple of days before the event, and we had a blast!! She even took some gorgeous photos of my House and posted about it HERE. 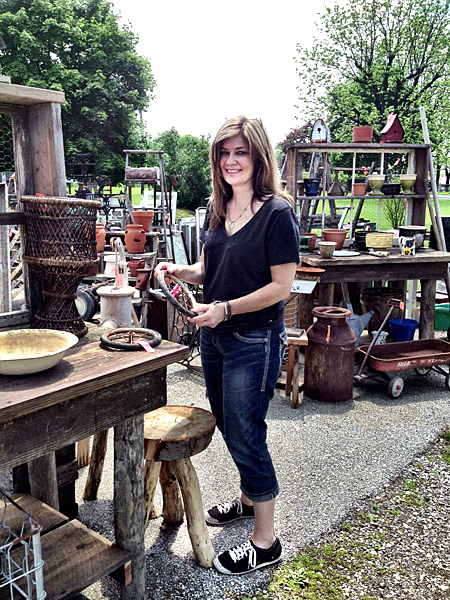 We headed up to Pennsylvania for a day of junking and site seeing! 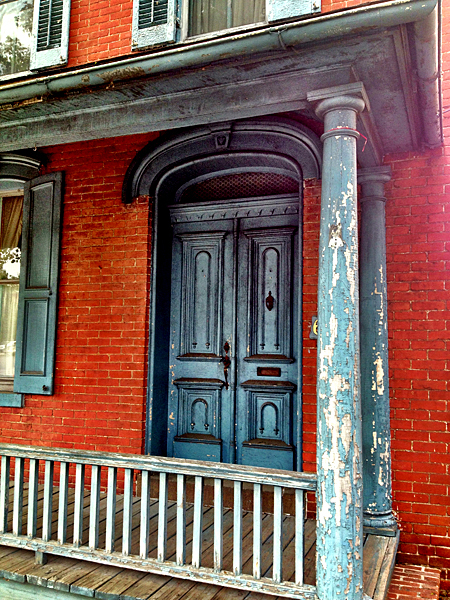 We walked around some small PA towns and check out the local architecture. Donna has loads of photos from that day HERE. We popped over to Marian, aka Miss Mustard Seed’s, house. It was the first time that she and Donna got to meet in person, I wish I would have filmed that meeting, it was so fun to see! 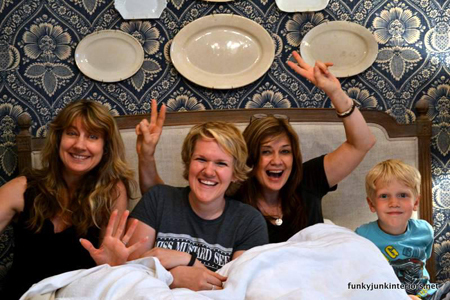 We couldn’t wait to check out the new gorgeous bed that she bought, and as you can see we jumped right in, along with one of her adorable little boys! A silly moment for sure! The next day we headed down to Lucketts to check out the Hometalk Tent. The Lucketts crew had it well stocked with all kinds of awesome junk, old wood, metal doodads, tools etc. We really didn’t have to do anything to it. It was perfect!! A big thanks to Heather at Lucketts, for making it perfect for us! We snooped around a bit during set up. Look what I spotted!! A fabulous dresser painted with my Ballerina Graphic! I had to check out Caroline’s tent, from Ekster Antiques. There’s always a crowd around it during the fair, so during set up is the only time you can really get photos of how fabulous it is! And it really is fabulous!!! 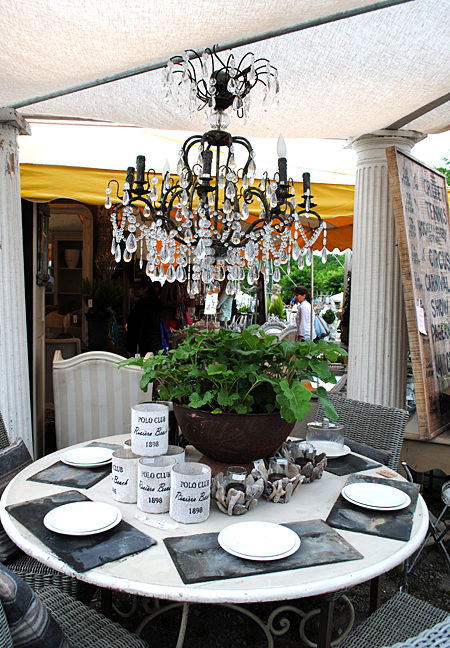 She’s from Europe and imports all kinds of gorgeous European things in! She has an amazing eye and is a ridiculously talented stylist as well! 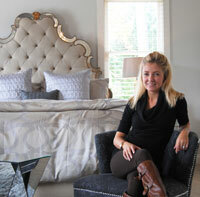 Donna made herself right at home in one of Caroline’s signature Grain Sack chairs. 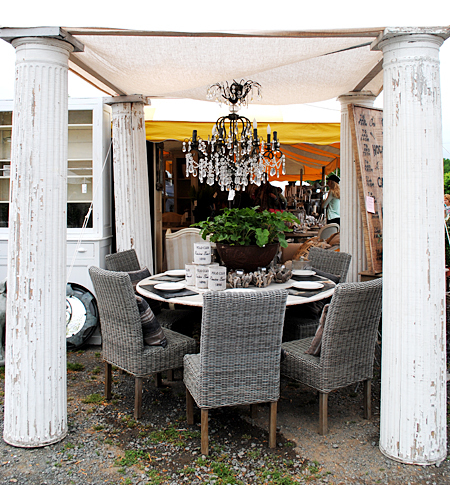 Pete, one of the dealers at Lucketts Store, always does a huge tent full of all kinds of wonderful things! I loved this stack of Ceiling tin tiles and Metal Numbers! Once set up was over, everyone zipped up their tents for the night! I’ll be posting more about the Spring Market and the Meet up next week. It was so much fun!! Thanks Leena! It was great seeing you too! It is a lot to see, if you can make it out for both days, that’s really the best way to do it! 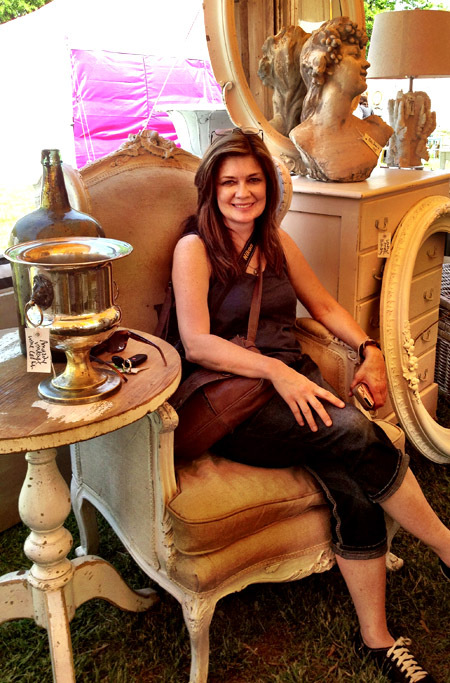 One of my greatest wishes is to make it to The Lucketts Spring Market! These photo only re-enforce that fantasy trip. I’ll be crossing my fingers for you Nancy, that you get to go next year! Great post! It’s so cool telling the same story with a slightly different twist. That dresser is the coolest! You can come back anytime Donna! I’m glad you liked my post! I’m so sorry you missed it!! I’m crossing my fingers that we can do it again next year too! I’ll be at Haven and so will Marian, and some of the other ladies that came to the meet up. Looking forward to meeting you there! Wow, this looks like fun! So great to meet everyone, too! Hi Linda, yes we all had such a blast!! For those of us following your blog where is this flea market, what state? Hi Gloria, it’s in Northern Virginia. 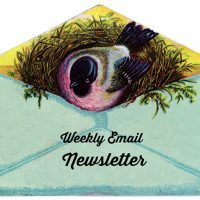 If you click on the words “Lucketts Spring Market” in the first paragraph, it will take you to the site for more info and directions. The Market is only once a year, but the shop is open every day year round and has lots of cool stuff too! 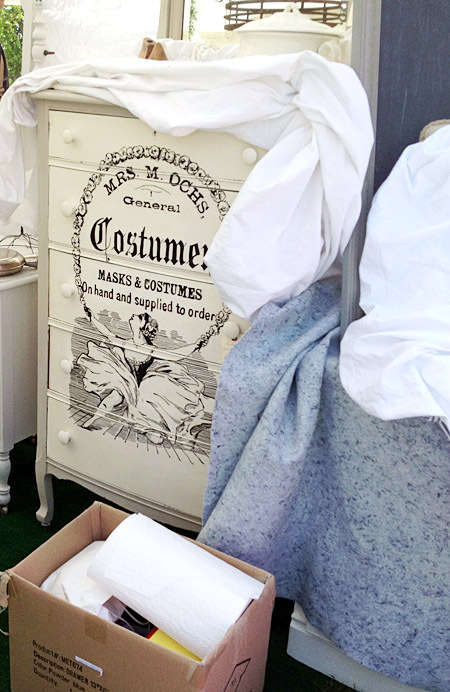 The dresser made with your graphic is gorgeous! Must have sold the first day because I didn’t see it on Sunday! I think it sold really quickly, I didn’t see it again after set up and I was looking for it! Oh it looks like an awesome time! 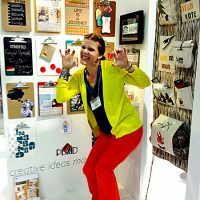 I love traveling to shop at events and meet up with friends, too!